Telling a story is something I’ve always been able to do. Even as early as third grade I can remember not knowing what the hell an adverb was, but being able to create a narrative with a beginning, middle, and end. Since I was terrible at diagramming sentences, that’s how I passed English up through high school. The irony that I’ve managed to accumulate both a bachelor’s and a master’s degree in English and writing isn’t lost on me. Proved many guidance counselors wrong in my lifetime let me tell you. I think my style is gritty, almost noir, and a little flippant or touch-in-cheek. I’m sure a reader could answer this question much better than I could. I think my style is one way, but a reader could see it as something completely different. That’s what is so amazing about telling stories and writing. Once it’s out of your hands, everything has a life of its own and it’s completely open to interpretation. That’s a tough one, because I think each reader could take their own unique message from the book, y’know? Family is very central to the story and the lengths a parent will go to protect their child as well as the rocky process that is growing up. Granted, we’re dealing with werewolves here so the stakes are a bit higher, but the themes are the same. Each main character in Demos City Blues has a family that’s broken in some fashion. The characters’ struggle to form new bonds, new families, while dealing with a malevolent force corrupting the institutions designed to work for them (police, government, etc) is the axle that turns the wheel. Overheard dialogue is fun to incorporate into chapters and exchanges between characters. When I was in grad’ school, that was actually one of our weekly assignments in one of my fiction workshops – go to a coffee shop or a public place, sit down, and write what you hear people saying. It’s great when people catch you doing it and they freak out. When it comes to actual people influencing characters, I try to stay away from it. I might take an emotion from a relationship I’ve had or a way some event made me feel and use that, but each character is unique in their own right. Glen Cook and Glen Duncan have been very influential in my creative work. Cook brought fantasy, all the sorcerers and kings and heroes, down to the human level. Regular people in extraordinary circumstances is really appealing to me, and I’ve tried to work that into my Demos City Reports series. Werewolves are people, and they have unique struggles, including their status as a minority. Supernatural creatures as a marginalized group was an interesting angle for me to take – or at least I hope it is. Duncan has a masterful wit in his work and he’s distinctly British, which I love. If you want a guide for how to construct a distinct voice, Glen Duncan’s work should be your gospels. I’ve been fortunate to be able to study writing and work with some of the best out there, at least in my opinion. The writers who teach and visit Naropa University…that’s Allen Ginsberg’s hippie school in Boulder, CO, if you don’t know it, check it out. I’m a proud graduate of the Jack Kerouac School of Disembodied Poetics at Naropa – that’s a mouthful I know. The writers and poets I studied under there – Anselm Hollo, Bobbie Louise Hawkins, Amiri Baraka, Quincy Troupe – taught me things that I carry with me to each page and probably life in general. All those teachings and life lessons make up a quilt that forms your writing style and how you approach the word. This is a little 400-ish-word excerpt from Demos City Blues. “He might need a hospital.” Jack laughed drunkenly. “We’re werewolves Leon,” he said between laughs. “That little cut won’t stay there long.” I decided my vision was clear enough to try standing. I’d have a pounding headache soon, no denying that. Putting one foot in front of the other proved possible, so I started for the door again. Jack threw out a hand to stop me. “I need you for this one,” he said in a deeply worried voice. The veil of drunken bravado was gone and the Old Wolf was playing it desperate. Standing closer to him, I could see his white hair was slick, weighed down with sweat. I rubbed my rapidly swelling jaw. “Sometimes the devil you know is the better choice,” Jack cautioned. “If Althea wins, you might not like what this city turns into, who you turn into.” There wasn’t any way to help Jackson even if I wanted to. Joining his pack would leave Shauna vulnerable to Poole and whatever angle he was still working to get my daughter. He’d file some damn formal complaint about me joining a pack and denying Shauna her blood ties. He’d win my daughter by some political black magic. That’s exactly the reason why I won’t ever join a werewolf pack. That’s not how family should operate. I opened the door to Jack’s office and was about to step through when the Alpha said one last thing. “Yeah Harper, I know.” Let it roll off, just walk right out the door. I didn’t respond, didn’t even open my mouth until I was back in my truck. There’s something about the inside of a truck cabin. It can feel shuttered from the rest of the world, if you close your eyes. The dancing throb in my head ebbed for a moment in its quiet bubble. Then, just as I was about to start the engine, my head bumped the sun visor and an old bottle of aspirin fell into my lap. I think I hugged the steering wheel for a good five minutes before hitting the gas. Glen Duncan is my favorite author easily. The first time I read ‘I, Lucifer’ I nearly crapped my soul with laughter. Every time he puts out a book, I have about a week of depression and peaked anxiety afterwards wondering why I didn’t think of his idea first and how I’ve managed to fail yet again as a human being. His work makes me question my worth as an individual, it’s that good. Research is so important for the authenticity of any creative work. Readers aren’t fools and they’ll spot the details that don’t belong in a second. Once they notice your narrative doesn’t have all the parts where it should be, they’ve lost interest and you as a write have missed an opportunity to build a relationship. To give you an idea of how much I research: I was writing the prologue for the third book in this series, and I wanted a character to make a movie reference, so I searched for blockbuster films out at the time the prologue would be happening – 1999. Low and behold, Stars Wars: The Phantom Menace was the highest-grossing film that year. So, the character, who was 18 at the time, made a Lightsaber reference. Do not stop writing. Ever. Not for any reason. If it feels like nothing is working, and everything you’re putting out there isn’t worth a damn, don’t worry. That’s exactly what’s supposed to happen. You can’t find the story worth telling until you get all the old clothes out of the way, all the shirts that don’t fit you anymore. War is coming to Demos City -- in more ways than one. Leon Gray struggles to balance a new job with helping his daughter Shauna navigate the landmine life of a full werewolf. Further complicating matters, a new Alpha has arrived in Demos, laying claim to the territory as her own -- including Leon. Meanwhile, the political information David Hastings unearthed may reveal a much darker truth than anyone expected. Demos City's corruption has deep roots, older than the bones of the town itself. Can Gray and Hastings keep the city from tearing itself apart long enough to discover the source? Can it wait until Leon sees Shauna's high school play? As the first snow falls, the flakes may only have bloody footprints to greet them on the earth below. 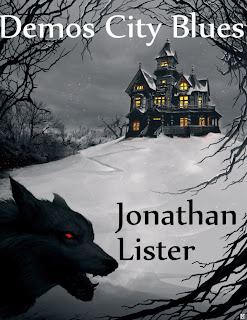 Jonathan Lister lives in the Philadelphia area and is a full-time writer. 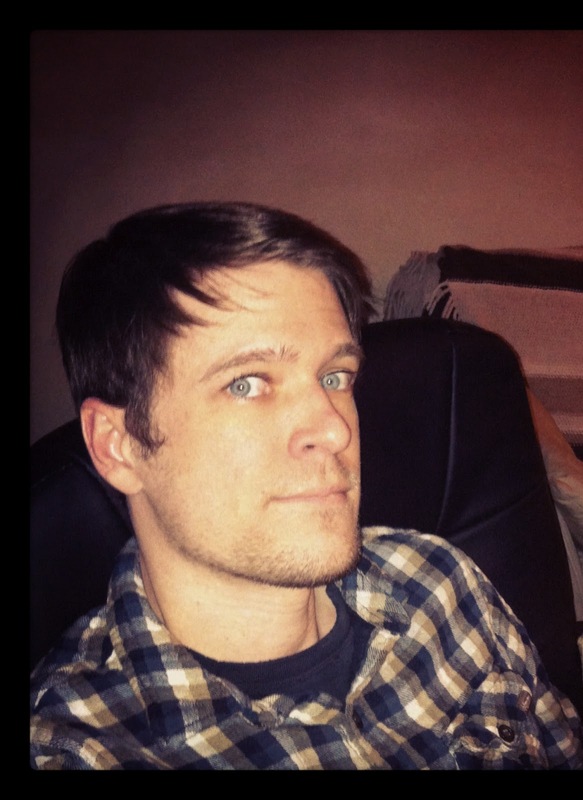 He holds a Bachelor of Arts in English from Shippensburg University and a Master of Fine Arts in Writing & Poetics from Naropa University. His work has appeared in outlets of USA Today, The Houston Chronicle, Matter, Square One and Image Magazine among others. He wrote his first two books in 2009 from midnight til 4 a.m. while waiting tables during the daylight hours. 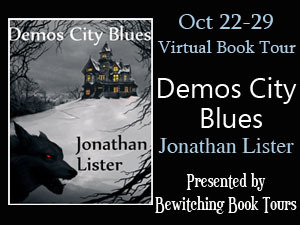 DEMOS CITY BLUES is his second urban fantasy novel. Jonathan drinks too much coffee and appreciates your time.